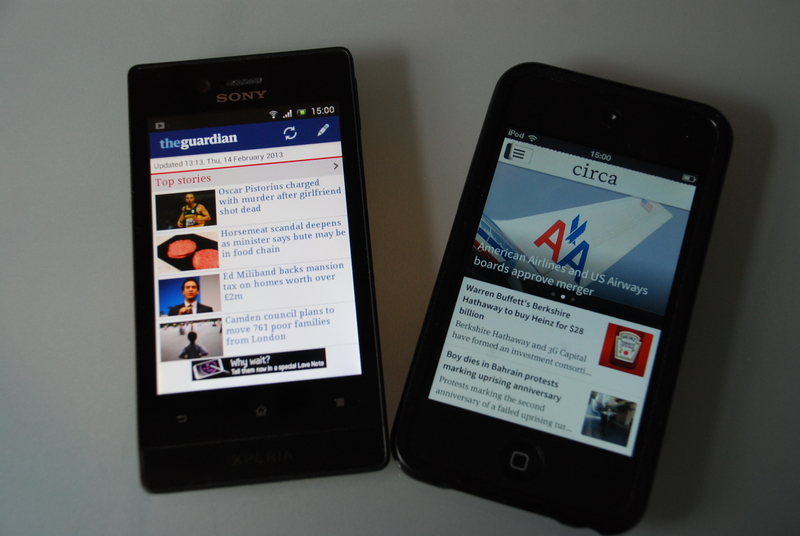 Mobile first: news re-imagined for smartphones – or just borrowed? I’ll start with a declaration of interest. I am a journalist who recently took a severance package and decided to strike out in new directions because my employer, the Guardian, was pleading poverty in the changing media marketplace. The editor wanted to cut the editorial staff and hire more developers. I still have to make a living to pay the bills and hope to continue to do so from my journalistic efforts. So you will, I hope, understand why I’m not entirely happy when people appear to appropriate the work of professional journalists. That is, I believe, what the creators of a free mobile app called Circa risk doing while presenting their software as a new way of telling stories on portable devices. Circa denies that characterisation and their rebuttal appears later. And: “Rather than shoehorning existing content into a new environment, Circa is creating the first born-on-mobile news experience, delivering it in a format native to mobile devices, with an experience intuitive to mobile users. “Through comprehensive yet concise news updates paired with a clean, simple mobile experience, Circa redefines how news is produced, delivered, and consumed. I’m wary when people reinvent the wheel [as an aside I’d include in that the carmakers who have decreed that the spare wheel must go to save weight]. I also suspect that rivals, including the Guardian which has apps for Apple, Android and Blackberry devices, might have something to say about the “shoehorning existing content” claim. The latter link was to a page that did not exist when I tried it. Circa licenses some photographs, which will cost money. It is not stated if it subscribes to the newswires or pays royalties to news sites whose copy it re-imagines for “points”. But it is wire services and news outlets who hire reporters to find stories, point by point, quote by quote. Sometimes it’s at considerable risk to their health in the world’s troublespots. And that doesn’t come cheap. And in an earlier piece when the app launched, journalism.co.uk reported: “Cohn explains that the app features original content, in that it is all written by the Circa team, but ‘it is not original reporting. Up to a point, Lord Copper. Copyright law and cases of plagiarism are difficult both to establish and enforce in the internet free-for-all. The music industry has similar issues with sampling. But re-imagining is not necessarily creating original content. The UK government’s Intellectual Property Office puts it this way (their emphasis): “A work can only be original if it is the result of independent creative effort. It will not be original if it has been copied from something that already exists. If it is similar to something that already exists but there has been no copying from the existing work either directly or indirectly, then it may be original. I put three questions to Circa: I note that you are licensing photos from Reuters, Library of Congress etc. Do you similarly subscribe to the newswires or pay a royalty to news sites for re-use of their words? Do you intend to hire reporters to generate exclusive stories? How do you respond to the suggestion that you appear to be appropriating other people’s original work? The question of “re-use” is an interesting one. I would argue that what we’re doing is not “re-using” any particular content. Our editorial staff gathers information from many different places and works to identify the core facts and details, then distills them using our own language and research. The writing is accomplished much in the same way as traditional organizations, when they don’t have staff report[er]s on-site. While on a daily basis I see many publications writing stories about various topics, without citation of any of their sources, we make sure that all of the source material that helps us write our stories, gets cited. That’s not to say that we took content straight from the source, and republished it. In some instances where only a single source is available we write “SOURCE is reporting that…” much in the same way any other publication would. However, in the event that we’ve found many sources, which is far more common occurrence, we identify the facts common among them and report those. One example where we’ve gone above and beyond just “re-use” is a story that surfaced last week about California school districts. The AP reported there to be “nearly 3,000” districts, and that information was later re-used in an LA Times article, as well as others. But through our research we discovered that number to be closer to 1,000 and reported that as such. We use many sources as the BASIS of what we write, but don’t use them as the final word – that is ours. To answer your question: “Appropriating work” insinuates that we’re using someone else’s original reporting and publishing content that uses that same original reporting as the basis of our work. We’re no more guilty in that regard than many, many other publications that do the exact same thing. I don’t have any hard statistics on this, but I would believe that the vast majority of stories written in the world were not produced by the original source. This is all a result of our limited staff right now. We have 13 writers, 11 of which are part-time, doing our best to identify the biggest news of the world, and cover all 24 hours of the day. As we grow, we may have the ability to have feet on the ground and do what’s commonly referred to as “original reporting” though. But beyond all of this, the crux of the issue is really whether or not we’re giving something back into the ecosystem. We recognize that we are currently and only ever intend on being the “brief” for someone. It’s likely that people that are interested in various stories may be inclined to want to read further on a topic. As such, in a future update to our app, we intend on curating the best articles that help further develop the stories we write about, and surface them for further reading. That traffic would be sent directly back to the publisher’s website, or an arrangement would be made to include it directly within the app. Galligan’s point that most stories are not produced by the original source is a valid one and similar to arguments by Nick Davies in Flat Earth News. It touches on Alan Rusbridger’s argument that the Guardian should do less “commodity news”. With apps delivering push notifications, 24/7 rolling TV news and newspaper websites with breaking news, what feels like an avalanche of content often consists of very few facts padded out with the “fluff, filler, or commentary” that Circa has identified as ripe for editing. In part, it’s because there are fewer and fewer reporters trying to provide copy for more and more platforms. And web subs are not encourage to spend time cutting and honing stories as their newspaper counterparts must do. Without reporters on the ground there is no news to distill, whether for the Guardian or Circa. My redundancy cheque was not the first in a news industry which needs new entrants such as Circa, whose business and editorial model is a work in progress. Readers have told them they want more UK material. My hope is that they will hire some reporters, as well as editors, to provide it. By their own sweat. This entry was posted in Media and tagged Apps, Circa, Guardian, Journalism, News, Smartphones, technology on February 14, 2013 by paulnettleton.